Hello, hello! I hope you are all having a great start to the new week! I just wanted to pop in and share a few tidbits of info since we have several fun things ahead this week (and month). 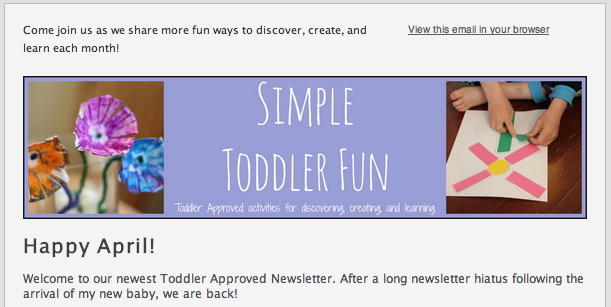 First off, after a super long hiatus, my monthly Toddler Approved Newsletter is back! Many of you subscribed when I first announced the newsletter back in June and tuned in each month... and then when our new baby arrived in October I put it on hold. I am so excited to have it starting back up again in a little bit of a revised format. If you don't already subscribe, you can go here (or subscribe in our sidebar) and get a monthly newsletter with fun ideas sent to your inbox. Our newsletter is called Simple Toddler Fun and features simple activities for you to do with your kids that are quick, easy, and educational. Second... as you know we love discovering new books and authors! 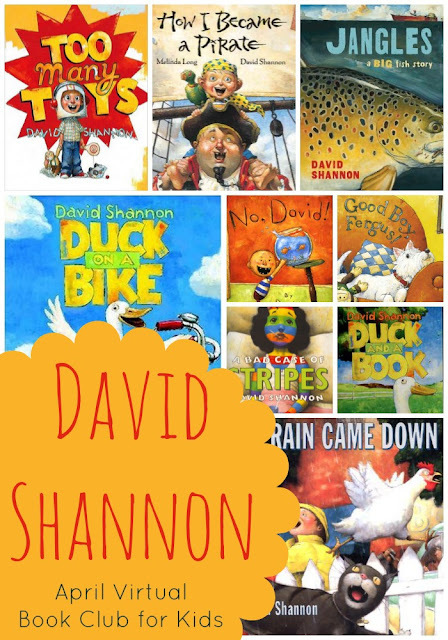 This month we are hosting Virtual Book Club for Kids on April 15th and spotlighting books by David Shannon. We'll be sharing craft and activity ideas to go along with How I Became a Pirate and David Goes To School. We are also participating in Poppins Book Nook and are featuring books about wizards. This is a new subject for my kids... so it should be fun. We'll share our posts on April 22nd. Here are two wizard themed books we are going to read this month and then we'll be doing some crafts and activities along with them. Third... I just realized I was a total flake last month and wanted to apologize. 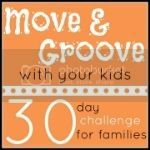 Remember last month when I was super pumped to Move and Groove with my Kids and do a 30 Day challenge with you? I totally got started strong and then completely forgot about it once the craziness of our home remodel settled in. Ugh! We will need to try that again when my brain is less forgetful. We've definitely been moving a lot (mostly running circles around our kitchen island), but not nearly enough! Fourth.... in an attempt to actually be organized and intentional about my parenting (something I am really struggling with right now since my house is so DIS-organized and messy)... I wanted to share a few of my goals with you this week. If you set goals, I'd love for you to share yours with me too. Back in January I introduced you to our family a bit and shared some of our goals with you. I set six goals that I wanted to work on in 2013 and I need to be more intentional about accomplishing them! This week I have created six assignments for myself based on my goals. 2. Choose to look for the positive and use words that uplift. 3. Have uninterrupted playtime with the kids each day for one hour. No screens, no phone calls, no photos/instagram. Just me and them. 4. Go running at least 4 times and go on a walk by myself. 5. Go on a surprise Friday adventure... and don't tell the kids ahead of time what it will be. 6. Have family dinner and prayers together each night. This is tough with our busy evening schedules, but so important for us! I'm excited to see how these go. So... are you ready for a great week? Do you set weekly goals? What are yours this week? If you created a family mantra, what would it include?